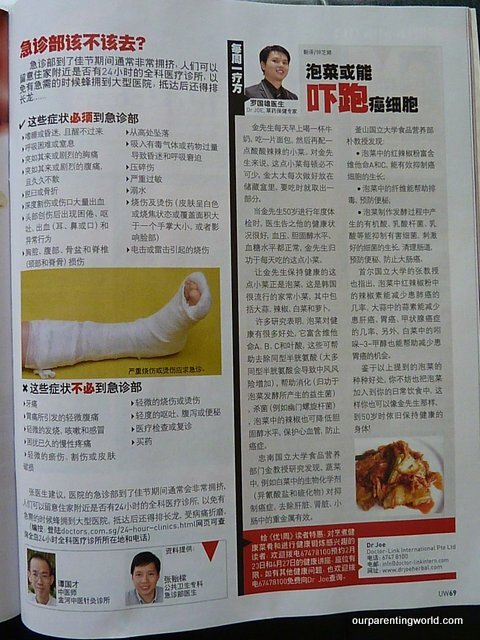 Daddy was interviewed by U Weekly Magazine or UW优1周 in Chinese on festive acquired emergency conditions. U Weekly is one of Singapore’s most popular entertainment, lifestyle and social news magazine. Daddy talked about during festive period like Chinese New Year, what are the most common illness seen by Accident and Emergency (A&E) Department and what can individuals do to prevent these emergency conditions. What are the medical conditions that are considered to be emergency and required to go to A&E and what you can do to alleviate the sufferings before going to A&E? Grab a copy of the U Weekly Magazine which is a comprehensive magazine that covers Entertainment, Lifestyle, Fashion and Food in a compact size for S$2 each.